Ladies Newlook black coated jeans. Size 10 with 28inch leg length. Leather Look, matte coated. Zip and button fastening. Pockets. High waisted, great fit . Condition is New with tags. Dispatched with Royal Mail 2nd Class. Ladies Size 14 Reg M&S BNWT shiny Leather Look Jeggings Black Last Pair! 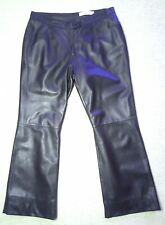 Ladies Size 14 Reg M&S BNWT shiny Leather Look Jeggings Black Last Pair!. Condition is New with tags. Dispatched with Royal Mail 2nd Class. Trousers : Pantalon Hose Pantaloni Pantalones 裤子 Bukser Broek Housut παντελόνι पतलून ズボン Cpodnie calças брюки Byxor Pantolon. 33ins 84cms around WAIST. Waist 32ins 81cm(-1ins/2.5cm). Waist 33ins 84cms (Item size ). LADIES GORGEOUS RIVER ISLAND LEATHER PIPING JEANS IN GREAT CONDITION. PERFECT FOR CURRENT WEATHER. GRAB YOURSELF A BARGAIN. M&S Black Slim Fit Bootcut Belted Jeans. Size W27 L28. 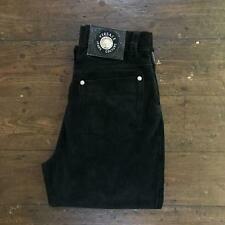 Lovely designer Versace suede trousers. High waisted. 100% authentic. Beautifully made using quality materials. Rag and bone skinny leggings/jeans. Funky detailing on the side with embossed leather trimmings. WOW! Dolce & Gabbana Army Style Trousers Jeans. Sits At Or Below The Waist. Baggy Seat And Thigh. Tapered Cuffed Leg. Zippered Ankles. Were Over £300 New. In Excellent Condition, With No Wear Or Fraying To The Hems Or Pockets. Garment Size; ​Waist 28". Size 42. Size 10 UK. Leg 28". Hem 5.5". Front Rise 10.5". Zip Fly. Khaki And Brown. Jeans UK Sizing Guide W24 & W25 Size 6 W34 & W35 Size 16 W26 & W27 Size 8 W36 & W37 Size 18 W28 & W29 Size 10 W38 & W39 Size 20 W30 & W31 Size 12 W40 & W41 Size 22 W32 & W33 Size 14 W42 & W43 Size 24 See Photos For More Detail! Scroll Down For Supersize Photos. Please Note I Do Not Accept Offers! Thanks For Looking! While Your Here Why Not Check Out My Other Items. Discounted Postage For More Than One Item. Size: UK8 US4 EU36 IT40. Pictures are of actual item. For sale is an stunningly beautiful ACNE Studios Skinny fit leather "Lea" trousers in size UK8 US6 EU38. Classic five-pocket style. Zipper fly, button closure. Size, W28 uk10. The neat ankle length looks cool with sneakers and chic with heels and a blazer in the city. DIESEL BELTHY-ANKLE. Belthy-Ankle is a regular fit crop Straight style. inseam 28" to fit 30-34"inside leg. THE COOLEST PANTS ORIGINALLY £2385! NEW BUT DIRTY AND VERY HANDLED THEY HAVE 2 SMALL HOLES UNDER THE BELT HOOKS ON THE 2 BACK BELT HOOKS ON WAIST AS IN LAST PHOTO AND THEY ARE VERY VERY DIRTY BUT SINCE THEY ARE WHITE YOU MIGHT BE ABLE TO GET THE DIRT OUT SINCE THE DRY CLEANER DOES NOT NEED TO WORRY ABOUT THE FADE IN COLOR. Size on the label is 36 / Waist - 26 in. TOTAL LENGTH - 38.75" / 98.5 CM. RISE - 12" / 30.5 CM. WIDTH AT HEMS - 5.5" / 14 CM. The Jeans Trousers are good condition. LYING FLAT ON THE FLOOR. Each X Other Paris NEW black Skinny Jeans W25 L28” Inches BNWTS Lambskin Leather Panels. Condition is New with tags. Dispatched with Royal Mail Tracked 48. CARLA CARINI Leather Trousers. Nice pair of Ladies CARLA CARINI leather trousers. Straight leg. No pockets.Inner lining. I think will suit a W32 L28 would be the equivalent of a Uk 14. Made in Italy. Inseam 28" or 71 cm. Hip 19" or 48 cm. Cuff 7" or 18 cm. Thigh 9.5" or 24 cm. Waist 14" or 36 cm. Rise 9.5" or 24 cm.